This is heaven for me. You guys may not know it, but honey darlin', any kind of noodle soup is my ultimate comfort food. There's nothing that will soothe my soul or tickle any craving I have more than noodle soup. The Vietnamese style of noodle soup, Phở (pronounced more like "fuh") is a soup that I could probably eat non-stop everyday. Phở is in the good books with my family as well because my little sister, who has gluten intolerancy, can also partake in all of the noodle-y joy. 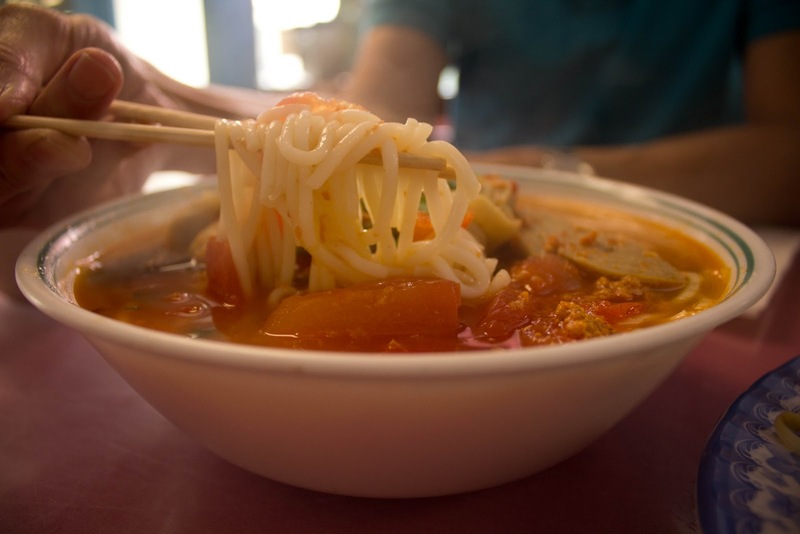 Located in Waikiki, Phở 97 has completely won my family and I over with its delicious Phở and its special "bun rieu." 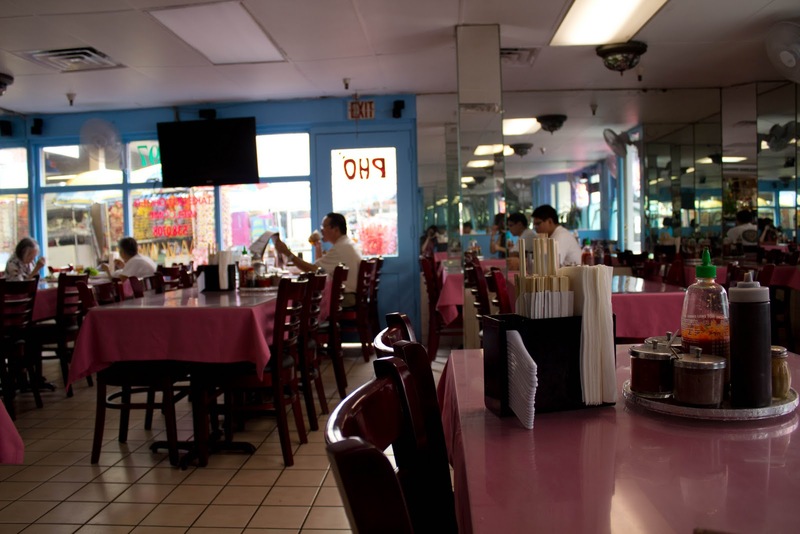 The interior is very, very basic and sort of characteristic of any local Chinatown in any city or country, cheap tile, pink tables, kinda messy, kinda grungy, but very popular and always pretty full. As said before in the "Thoughts from Waikiki" post, Hawaii is very much, at least in my opinion, "suspended in time." The Hawaiian Chinatown is pretty....ghetto, for lack of a better word. The sidewalks are narrow and a bit uneven, the paint and signs are faded from the sun, and the facades of many stores are in fact dated and run down. Despite all this, Chinatown is still bustling with life and in fact is the nexus for many of the cultural interactions that Hawaii is famous for. Anyway I digress, the main point of the story is Waikiki's Chinatown has damn good Vietnamese food. Every time my parents come to Hawaii, they come here and rave to me about how delicious it is. Finally, this most recent trip, they brought me here as well. Like any good Vietnamese restaurant should they offer you a thai basil, bean sprouts, and little wedges of lemons and chili peppers before your bowl of steaming hot soup comes out. 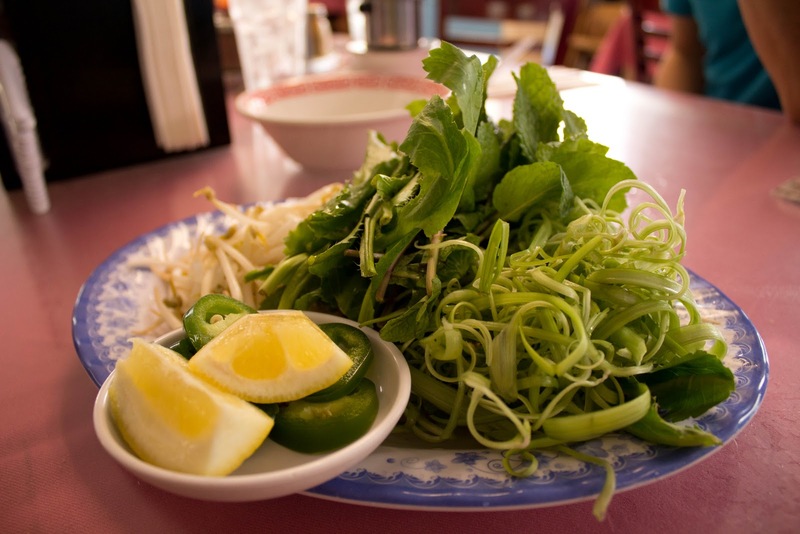 Something that you might not usually get at a Vietnamese restaurant are these two herbs: culantro and split water spinach. Culantro is slightly reminiscent of coriander, while the split water spinach sort of adds more texture than flavor. While I was in Taiwan, one of my half-Vietnamese friends told me that a necessity to "good phở " was the herbs. I certainly do believe her. =) My parents ask for the beansprouts to be blanched and usually eat most of them before the soup gets to the table. 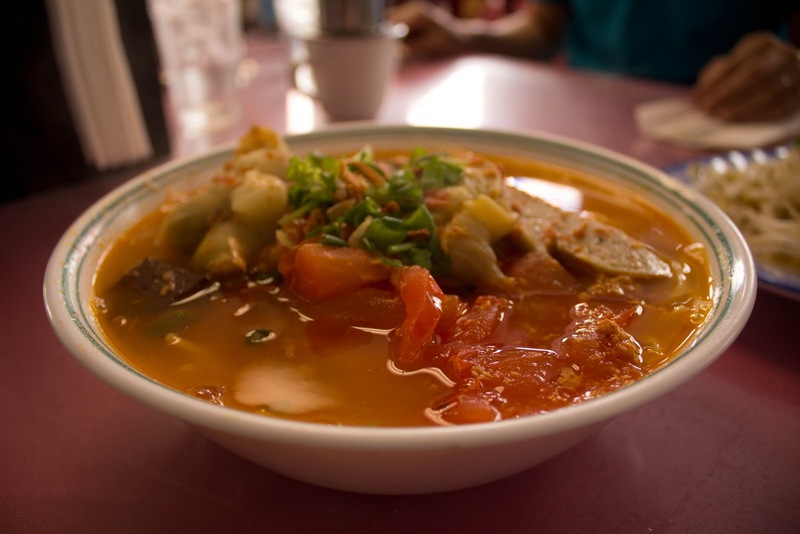 Although my family and I call this soup Bún riêu, the generic term for rice vermicelli soup, bún riêu cua is often our Bún riêu of choice. Bún riêu cua is a tomato and crab juice based rice vermicelli soup, served with fish cakes, tomato, pork hock, beef balls, and crab cakes. I think I should be careful to note that the "crab cakes" that I mention are not the Western style crab cakes, but instead more loosely packed together sumptuous morsels of crab meat. Altogether the combination of the varied seafood, viands, herbs, and vegetables make this an incredibly sumptuous umami laden dish. As usual, my poor vocabulary isn't vast enough to describe the intense collision of sea and land in this one bowl. The sheer variety of all the ingredients into one dish make the broth incredibly layered, complex, and leans towards the sweet side of taste. Bún riêu can usually be balanced out by adding another layer of flavor, in the form of mauve colored salty shrimp paste. 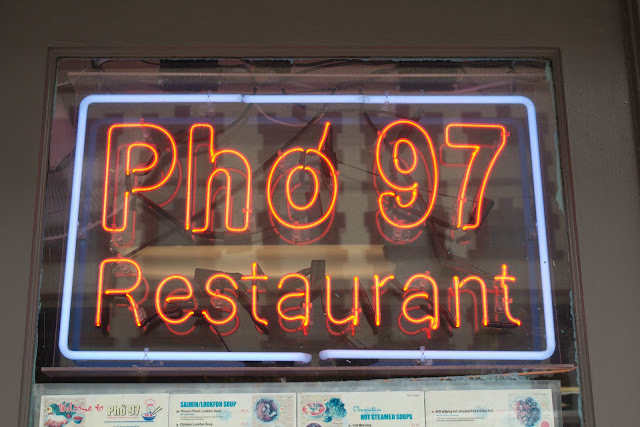 Phở 97 places all the little containers of shrimp paste on every table to use at will. Even if the grey paste looks scary. USE IT. Its scary appearance is well worth the additional flavor and complexity it will add to your soup. 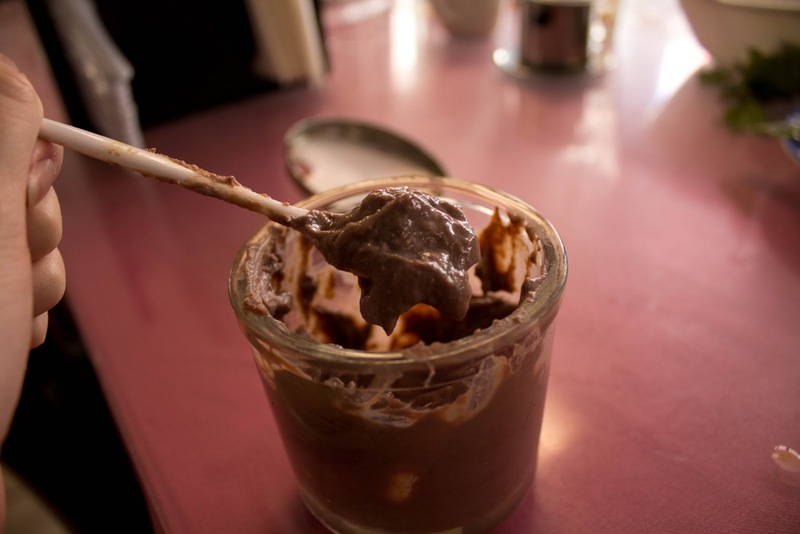 I prefer to put little dollops of the shrimp paste into my soup spoon or on my noodles, but my parents sometimes add a small scoop directly into the soup. Unfortunately I can't "review" any other dishes for you guys, because my family members all order the bún riêu cua. That's how good it is. Overall, Bún riêu, in any shape or form, is absolutely delicious and I encourage you guys to give Phở 97 a try if you're ever in Waikiki. Honestly, my parents can also contest to this, good, hearty, addictive phở places are hard to come by; especially places that make the more complicated bún bò Huế or bún riêu dishes. 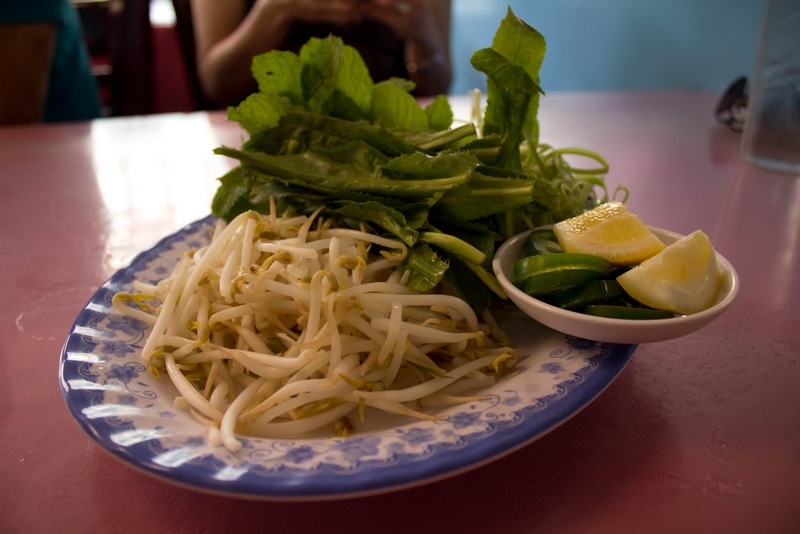 Its also an additional challenge to find Vietnamese places that make the above dishes well. >< Unfortunately, I haven't yet found a place in Vancouver to wet my craving for phở, but I know it's hiding here somewhere. If you ever go or have any suggestions for me to try here in Vancouver, please comment below! Went back and it was so lovely! Instagram update here!